If you sponsor, manage, or hold horse shows, competitions, or other events on your property, you are exposed to liability if something were to happen. Most events are short-term which last anywhere from 1 day to 15 days. These horse events may or may not be sanctioned by a state, regional, or national organization. Some events are put on by a horse club or association, charity, or groups of people. Regardless if the intent is to make a profit or raise funds for charity, you need to have equine liability insurance and event liability to safeguard your business. Events can have several different types and levels of public exposure, but first and foremost they involve participants and spectators. Under our insurance program participants that are not members of the insured organization are covered for bodily injury, while many insurance companies exclude this important coverage. (Note: Rodeo Participants are excluded from coverage for Bodily Injury under our policies.) Spectator’s bodily injury and property damage are generally covered by any event liability policy. But these are some other possible exposures as well: Advertisement of Events, Vendors, Livestock Providers, Hired & Non-Owned Auto, Food Service & Dining, Beer & Wine Service or Sales (not insured under a General Liability Policy; Dram Shop Insurance is required), Use of Rented / Borrowed Facilities & Grounds, Use of Public Property (such as Fair Grounds, Park, Public Streets & Parking Lots). Some events involve only 20 participants and less than 20 spectators. But some can have hundreds of participants, spectators, and potential crowd contact in the thousands. So the level of public exposure can be quite different depending upon the event. If you are a horse organization having numerous events during the year, you may want to consider an annual policy to insure all your events, members and member activities, and business activities, as it may cost less and provide better coverage. A Horse Business may be able to insure all their events and other services and activities under a Horse Farm, Stable & Ranch Owner’s Policy, or a Commercial Equine Operations Liability Policy. As an event sponsor, you worry that you may be sued or otherwise have a claim made against you for bodily injury or property damage by a participant, spectator, guest, bystander, or someone else who comes in contact with the event and property. If sued, you will need to hire a lawyer to defend you and you wonder how you would go about doing this. If found negligent or responsible, you would likely have to pay for a court-ordered or agreed-upon settlement to the injured party. Fortunately, much concern can be relieved when you buy a Commercial General Liability Policy [GL] to insure your events. Commercial General Liability Insurance protects you from financial loss should a participant, spectator, guest, bystander or a trespasser become injured [Bodily Injury] or their property is damaged [Property Damage] in relation to your operations, and they make a claim or file a lawsuit against you for damages. Holding a public event can be complicated and involve many people to assist, participate, and spectate. The presence and use of horses and other animals in unfamiliar surroundings with a lot of activity and stimulus around adds to the risk. Depending upon the type and size, event exposure is ranked moderate to moderately high. 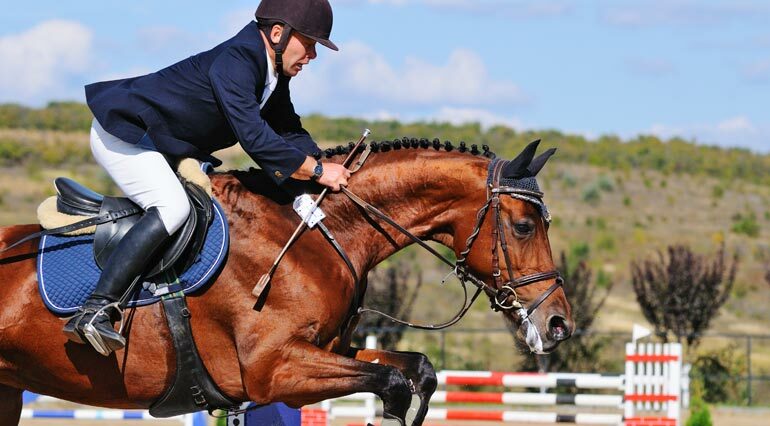 The fact that most people are riding their own animals (not owned by the event sponsor), and carry their own liability insurance, modifies the level of risk somewhat. Yet, a lot is happening in a short period of time and there is a fairly high potential for incidents to occur. Learn how to plan ahead with our Five-Pronged Strategy. Medical Expense: Pays for low-cost medical expense with no questions asked about your liability or responsibility in the matter. Legal Defense Costs: Today court costs and hiring of a lawyer can quickly mount to $50,000 or more, an expense you do not want to come out of your pocket if you are sued and have to hire a lawyer. If sued in relation to this activity, the policy provides legal defense whether the case has merit or not. Settlement or Claim Costs: For bodily injury and property damages for which you are responsible and held negligent and liable. 1. A spectator trips over a rope, a rock, or in a hole while walking the premises, and is injured. 2. A spectator is injured while watching the event by a flying object kicked up by a horse or thrown by someone, or bleachers may give way, or someone may fall from or on them. 3. A non-member participant is injured while warming up or participating in a class. 4. A participant’s horse gets away from a handler and gets into a roadway and is hit by a passing car. 5. Food purchased or provided at the event causes several people to contract food poisoning. Call Ark Agency right now at 1-800-328-8894 to request a horse insurance quote that will cover your exact needs and horse show event. Our team works with you directly to ensure you are receiving the best possible coverage. *General information is provided on this insurance topic. Acting on our coverage recommendations does not guarantee coverage if you have a loss or claim.